Dover’s House is on the south side of the High Street with The Lanterns on the east and Saxton House to the west. It was built on an original burgage plot with a malt house to the rear mentioned in some early documents. The front interior rooms show no visible signs of timber frame construction and there is a fine Georgian stair banister. The rooms at the rear seem to have been converted from an earlier construction. The earliest occupant we find, in 1697, was the father of a baker William Reade, and in 1739 Ann Reade, a widow, was living here. She seems to have died before 1770. What happened in the house between 1770 and the earliest deed for Dover’s House, a will of Charles Tidmarsh dated 2nd September 1819, is as yet unknown. The Tidmarsh family are described in the censuses as farmers and maltsters and they and their descendants owned the property now known as Dover’s House until 1896. From the Tidmarsh tomb in St James’s Churchyard and from the deeds, many family facts have been discovered. Charles Tidmarsh (I) and his widowed sister Sally Williams were the occupants of the house at the time of his death in 1823. Sally was entitled to live there until her death or remarriage. Beneficiaries were another Charles Tidmarsh (II) “yeoman of Northamptonshire”, James Tidmarsh “yeoman of Campden”, Thomas Nathaniel Tidmarsh of Kenilworth, William Williams of Fairford and Judith Edge, wife of Joseph Edge of Coln St Aldwyn – all nephews and niece of Charles. Charles (II) seems to have lived here running his malting business, but after he got into financial difficulties, James Tidmarsh bought the house in 1835. In 1841 it was occupied by James Tidmarsh, with his daughters, Mary, age 11 and Ann, age 10. His wife Mary was dead. 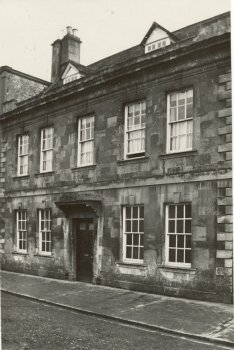 In 1851 James is still at Dover’s House, but with only one daughter at home, Ann, aged 20. His elder daughter Mary had just married Charles Izod, a “Chymist of Evesham” at St James’s Church on 4th February 1851, so is now living elsewhere. James Tidmarsh died in 1858 and was buried in the family tomb in St. James’s churchyard. In 1861 Mary, age 31, with her husband Charles Izod, age 33, now a maltster and farmer of 65 acres, employing 2 labourers, are occupying Dover’s House, having bought it from James’s estate in 1859. Interestingly, in the Grammar School deeds (of which he was a trustee) in 1862 he was also described as a coal merchant and maltster. From researches we find no children born to Mary and Charles and they are alone in the house with Fanny Ladbrook, a general servant, in 1871 and 1881. By 1891 Charles Izod age 63 is a widower, still a maltster & farmer. Mary had died in 1888, Charles died in 1896 and so the Tidmarsh/Izod family connection with Dover’s House ended after 75 years. Henry Joseph Hands, ‘Chemist & Druggist’, bought Dover’s House in 1896, when he was 41 years old. He had taken over his parent’s chemist shop on the corner of Church Street, which was started before 1851. His father Joseph was dead, but in 1881 his mother Elizabeth, aged 55, was still working as ‘Chemist and Grocer’, although by 1891 she was retired and living in Leysbourne. Henry Hands had married Rosellen Roberts, daughter of Roberts of the draper’s shop in the High Street and by 1895 they had seven children. Henry carried on working until 1910 and then handed over the Chemists to his son Reginald Harry Hands. Henry died in 1920 and his executors, Reginald of The Pharmacy, Hunstanton, Norfolk and his brother, Joseph Garnet Hands, architect, of Forest Hill, London, sold Dover’s House for £1400. The Hands family do not seem to have ever lived in Dover’s House but at 4 North End Terrace and at their shop. 1921–1926 Miss Agnes Smith of Rhine House, Stratford–upon-Avon bought Dovers House, which still encompassed the ‘former Malt House, bakehouse, barns, stables, pig styes, yards and garden outbuildings’. Nothing is yet known of Miss Smith. 1926–1942 – Paul Woodroffe, (1875-1954) a successful illustrator and stained glass artist, living in Westington, bought Dovers House in 1926 as an investment. He left his mark – a stained glass roundel of Little Miss Muffet. 1901 census – Edward Rimell, a 53 year-old rate collector from Weston-Sub-Edge with his wife, Ann, age 51, and 14-year-old niece, Gladys Dunn. 1906-1930 – Frederick Landseer Griggs (1876-1938) had a long tenancy, during which the name ‘Dover’s House’ was first used.